I have to tell you, friends, I’m feeling a little pressure here. Like I need to choose my words carefully to convey to you how good this dish is. (How’s this? So good.) Most of the time I feel like I’m preaching to the choir when I write here–I mean, who among us doesn’t love baked chard stems and butternut squash tacos and raw Brussels sprout salads? But here, with this dish, maybe we’re going out on a limb a little bit together. It’s fermented. It’s a little spicy. And I used white rice. Be fearless. This is the kind of food that makes your mouth tingle with happiness (maybe it’s all the salt, but still). The texture is crunch and chew, the flavors are savory and bright. If you’re not already mad for kimchi, you will be soon. This entry was posted in Asian Flavors, Eggs, Food, Grains, Recipes, Tofu, Vegan or Would-Be-Just-As-Good-Vegan and tagged cabbage, eggs, kimchi, rice, tofu on December 2, 2012 by emmycooks. This is a soup with a story. 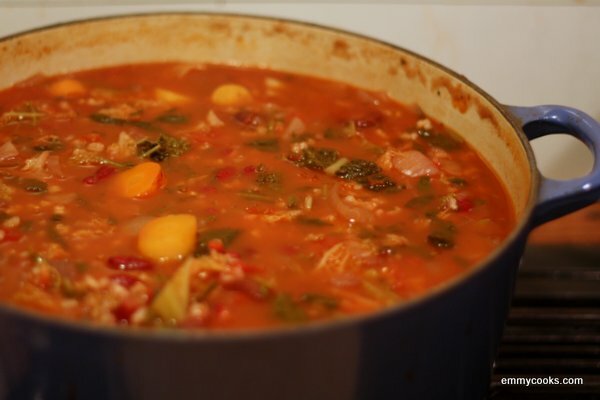 It’s essentially a minestrone, so you might think that our tale is going to start in Italy, with a grandmother tending a simmering pot for hours—and you’d be partly right. Except that this story is about my good friend’s great-grandparents, and the pot was simmering on a stove in a bar in Sacramento, California. Now, Sacramento has a long history as a drinking town. So from the first days of the California Gold Rush, to the speakeasies of prohibition, to—I can only imagine—the indulgences of today’s state government bigwigs, there has been a steady stream of drinking establishment clients in need of a little something to help them sober up. This entry was posted in Beans and Other Legumes, Easily Multiplies to Feed a Crowd, Food, Recipes, Soups, Vegan or Would-Be-Just-As-Good-Vegan and tagged broth, cabbage, carrots, celery, onions, spinach, tomatoes on October 25, 2012 by emmycooks. Today J picked the apples from our three backyard trees. It’s been a good year for the apples, and box after box came inside. Red, crisp, sweet. Hundreds of apples. The big girls posed proudly for a photo in front of the pile. The baby held an apple in each hand and seriously applied herself to the task of trading off bites. This entry was posted in Food, Fruit, Recipes, Salads and tagged apples, cabbage, creme fraiche, CSA recipes, fall recipes, salad, savoy cabbage, vegetarian salad on October 7, 2012 by emmycooks. 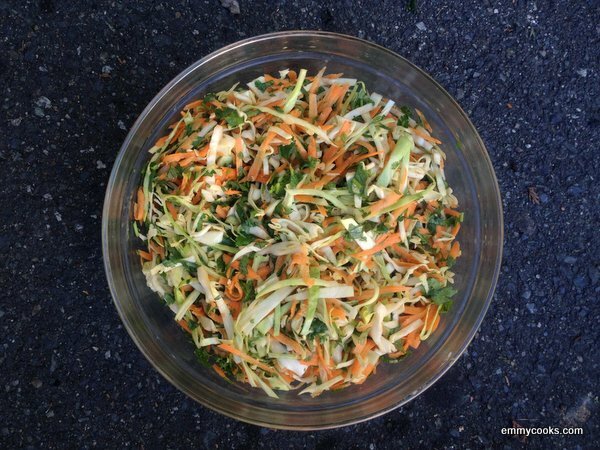 This entry was posted in Asian Flavors, Easily Multiplies to Feed a Crowd, Food, Grilling, Recipes, Salads, Vegan or Would-Be-Just-As-Good-Vegan and tagged cabbage, carrots, cilantro, coleslaw, slaw, spicy, Sriracha on September 2, 2012 by emmycooks.